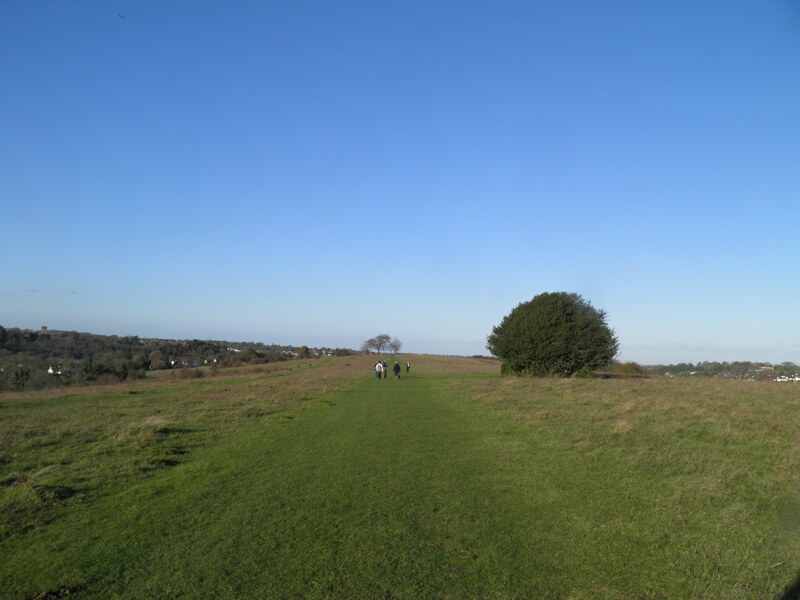 An easy walk along quiet valleys, through beech woods and along the ridge of the North Downs, with long views deep into Surrey and to the London skyline. Underfoot: Mainly quiet roads and well-made paths. A few field paths which will be sticky in winter around Chaldon. 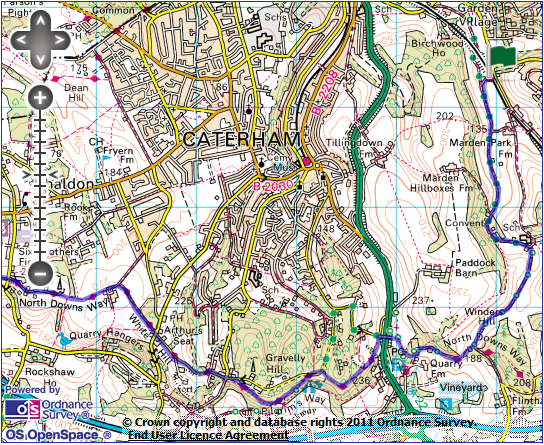 Maps: 1:50,000 Landranger 187 Dorking & Reigate; 1: 25 000 Explorer 146 Dorking, Box Hill & Reigate. Getting there: Woldingham is served by two Southern trains an hour (one per hour on Sundays) from London Victoria (32 mins) via East Croydon (15 mins) for connections from London Bridge. 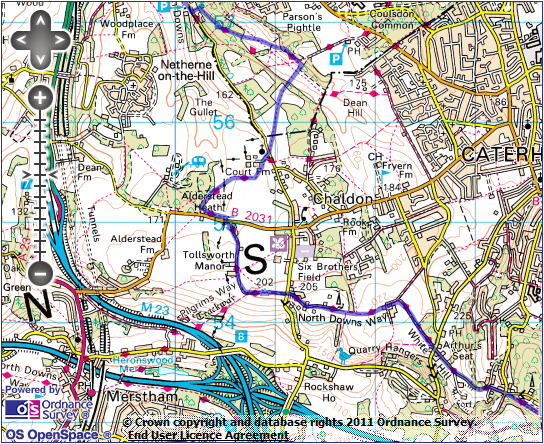 Useful websites: Parts of this walk follow the North Downs Way and the London LOOP. 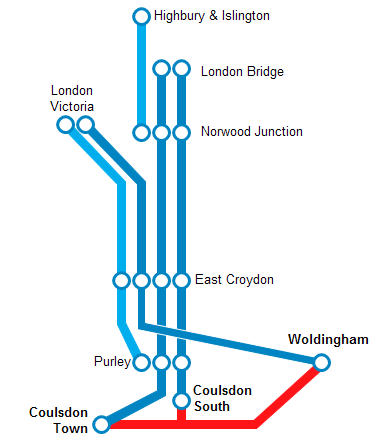 Getting home: The walk can be ended at Coulsdon South, which has 3 trains per hour (2 per hour on Sundays) to London Bridge (29 mins), via East Croydon (10 mins) for connections to London Victoria and Norwood Junction (16 mins) for London Overground connections. Alternatively, you can continue for ½ mile to Coulsdon Town (called ‘Smitham’ until September 2011) which has 2 trains hourly to London Bridge (30 mins), also via East Croydon and Norwood Junction. Monday-Saturday, there is an additional service per hour to Purley (5 mins) for an onward connection to London Victoria. Fares: The Coulsdon stations are in Zone 6; Woldingham is one stop outside the Travelcard zones.The cheapest ticket combination is to purchase an off-peak Zones 1-6 Travelcard for £8.00 (£3 child, £5.30 railcard), which covers the whole journey back, and a Upper Warlingham to Woldingham single for £1.90 (£0.95 child, £1.25 railcard) for the final part of the outward journey. well below the expanded village it serves, meaning that 15 minutes from Croydon you feel like you are alighting at an isolated rural wayside halt. Supposedly, in 1951, this was where Donald Maclean, member of the Cambridge Five ring of Soviet spies, fled from to reach the Channel coast and the Soviet Union. 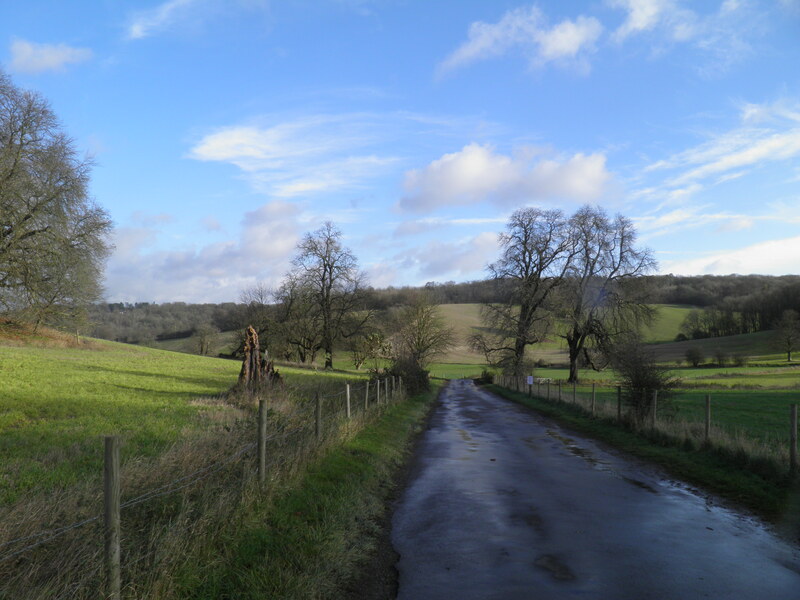 The road winds up this delightful quiet valley (part of Marden Park), with dark rook-infested woods on the right hand side to eventually reach a second lodge house and pass an automatic barrier to enter the campus of Woldingham School, passing between modern dormitory blocks and a more historic house half-hidden by huge yew trees. Woldingham School is a girls’ Roman Catholic boarding school which has been based here in Marden Park since 1946. Until 1984 the school was known as the Convent of the Sacred Heart, originally founded in Berrymead in 1842. It has educated large numbers of minor and deposed members of European royal houses, George Orwell’s wife and Tory MP and novelist Louise Mensch. climb gently uphill towards the head of the valley, passing tennis courts on your left. You have a good chance of seeing muntjac or deer running across some of the open slopes around here. At the top of the valley, you reach a junction in front of yet another lodge house. Turn right here on the North Downs Way (NDW), a firm path through the woods. Breaks in the trees give good views southwards over the M25 to the rolling Surrey countryside beyond. 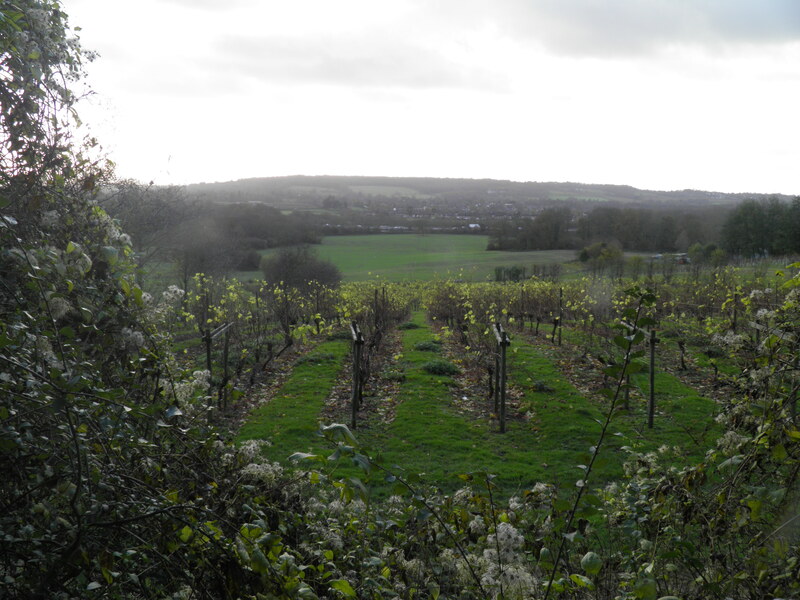 Closer, just below the ridge, are a small vineyard and the town of Godstone. Through a barrier, the path become a track, passing cottages. At the end of these, by the car parking area, turn left (still on NDW) on a little path, descending steps. You cross a small road and climb steps again, following a clear path uphill to join a byway. About 200m along here, turn left through a gap in the bank (no sign) to cross a field and reach a substantial footbridge over the A22 dual carriageway. On the opposite side, immediately turn left on NDW path. This briefly parallels the main road then climbs away from it up a series of steps, before generally leveling off and following the hillside until you eventually reach an open viewpoint beside a minor road. 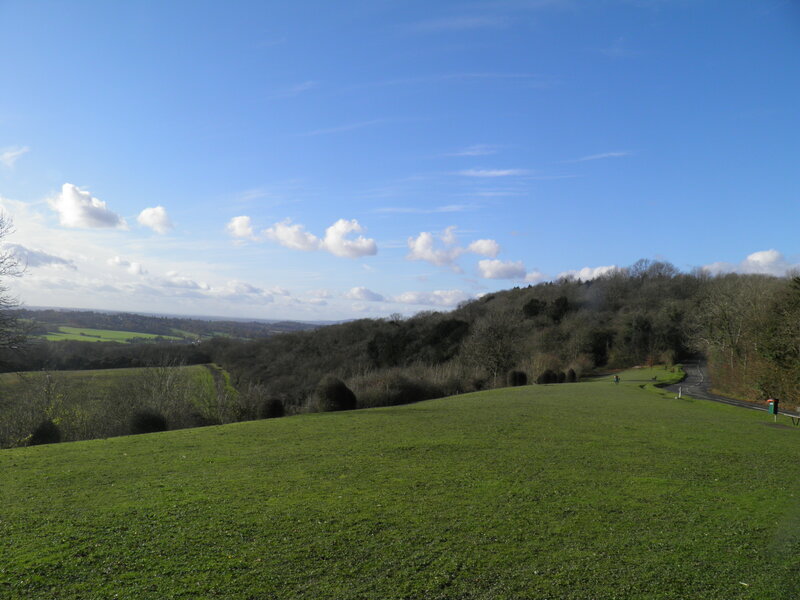 Along this hillside you have passed beneath the scant remains of Pilgrim Fort, part of a chain of 19th century installations to fortify the escarpment of the North Downs, as a stop line in front of London against invasion from the continent. the road (marked with a purple waymark). This soon joins an historic trackway cut out of the wooded hillside. At a junction after the bend in the track, keep right, following the NDW. You soon reach a four way path junction, where you fork left on the lower path. This leads through young woodland and emerged at a road junction. Keep straight ahead, along War Coppice Road. This passes a number of large houses at the very top of the Surrey commuter town of Caterham, the centre of which nestles in the valley to your right. The road then climbs gently out of the trees to give occasional views westward along the escarpment, until you pass Whitehill Tower to reach a road junction. Despite its medieval appearance, Whitehill Tower is merely a ruined folly, built by local landowner Jeremiah Long in 1862.
walk here) and take the track, marked as a dead end road, almost opposite. The track leads across open fields along the hill top. Once past the wood on the left, views open up northwards to the familiar landmarks of the London skyline, with the illusion of woods stretching almost to the foot of the Shard. At a track junction, turn left to pass exposed Willey Bank Farm, keeping straight ahead on the clear, sometimes muddy track along the hill top. You pass a wireless mast, and the track becomes a drive for a number of very large houses before reaching a minor road. Cross straight over onto a broad, tree lined path. You pass a triangulation point on your left. 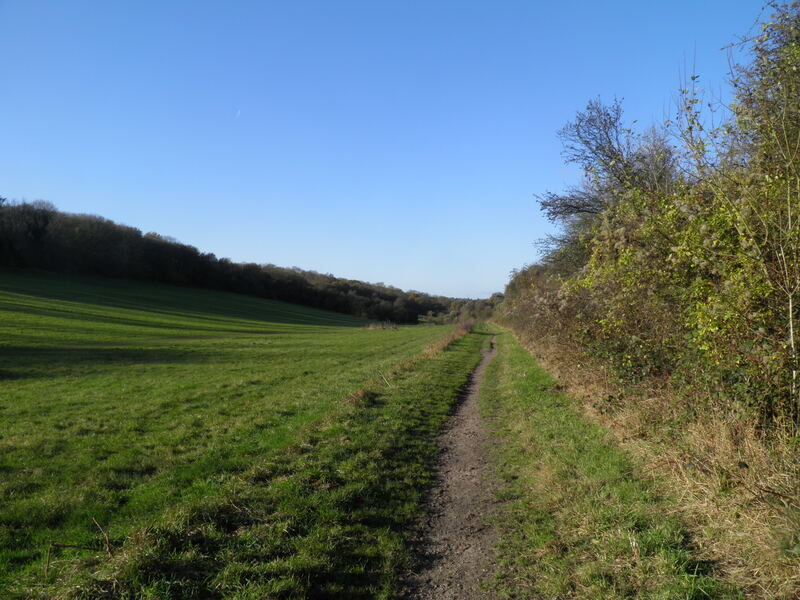 Emerging into a field, ignore the path descending the hill and follow the track round the corner to the right, towards to buildings of Tolworth Manor Farm. Dogleg left in front of a small modern house to join the concrete track passing the small manor house and eventually leading to the busy B2031 road. Cross with care, pass through the kissing gate and turn left along a field edge path beside the road. Enter the woodland ahead and at a signed cross-paths turn right. The clear path leads through trees to another signed junction, where you veer right through a kissing gate and back into the open fields. The broad path leads across the large wheat field towards Court Farm ahead, emerging on a track by Chaldon’s diminutive church. 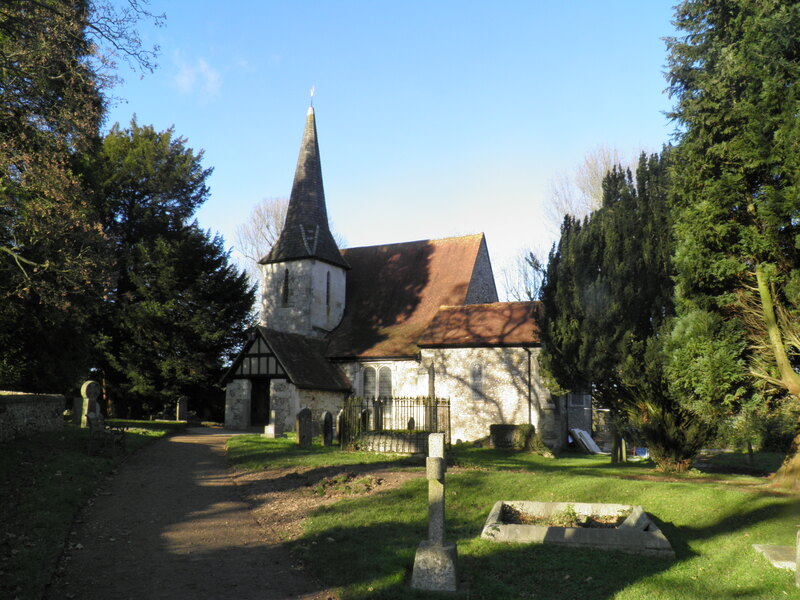 The church of St Peter and St Paul is situated a good kilometer north of the historic village centre of Chaldon (a village sometimes nicknamed ‘Little Switzerland’ due to the amounts of snow it can receive). The current church dates from the 11th century and if you find it open, it is well worth popping inside to see the remarkable 12th century fresco of scenes of salvation and damnation. Fork left by the church to join the road and after around 50m turn right at a footpath sign (marked to ‘Happy Valley’). 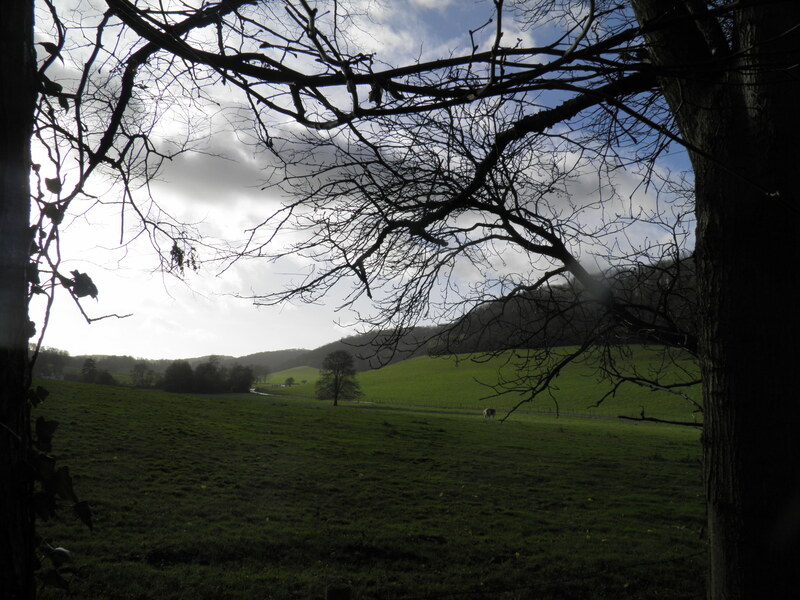 A broad path climbs across the field ahead, before dropping through a narrow belt of woodland into the grassy downland valley of Happy Valley. Drop into the valley bottom and turn left along the clear track along wood edge. 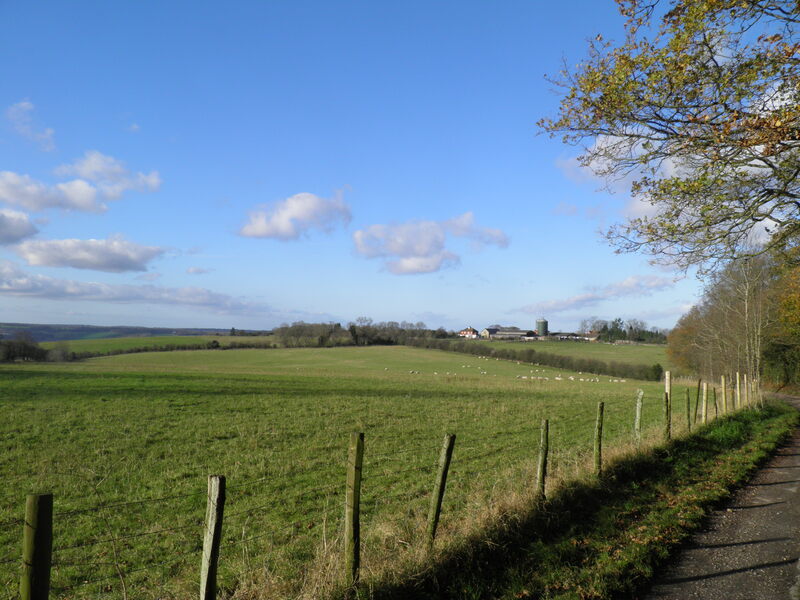 250 acre area of downland and woodland purchased by the then Urban District Council of Coulsdon and Purley in 1937 as green belt. Many similar areas of downs around here were lost to sprawling urban development in the inter-war years, so this was highly fortuitous. The Valley is now classified as a Site of Special Scientific Interest as an important example of chalkland and neutral grassland habitat. After a hedge, where the bridlepath you are following begins to climb, keep to the grassy path along the valley floor. On reaching the edge of a wood, turn left up the edge of it. At the corner of the woods, turn right on a signed path (to ‘Farthing Downs’) into the wood. Follow this broad path gently uphill until it breaks into the open. Here turn left uphill beside Farthing Down Cottages to reach the road that runs along the top of the ridge. Cross the road, pass through the small car park and turn right on a gravel path. Where this ends at a circular bench keep straight ahead over the downs, paralleling the road. These high downs are grazed by cows to keep the grassland habitat refreshed – they sport reflective spats to protect them on the unfenced road! You come eventually to a large signpost amongst an isolated group of trees. 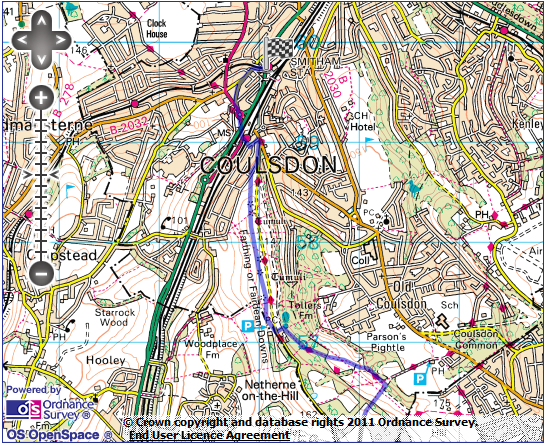 Ignore the fact that it points right to Coulsdon and instead keep descending ahead, supposedly towards Purley. At the bottom of the hill, veer left through a foot gate onto a road of smart Edwardian terraced houses, turning right, to join a busier road. For Coulsdon South station, take the first left (Red Down Way) then right on a small snicket, signed to the station, which is about 50m further on. For Coulsdon Town station continue straight ahead under the railway bridges and keep straight ahead at the roundabout. Cross the road at the traffic lights and head along Coulsdon High Street. Keep straight ahead at the mini-roundabout and turn right just before the railway bridge to reach the station.